"My the Other, Other Half" alludes to the relationships we choose in life. We most commonly think of an "other half" when it comes to choosing a life partner. But considering the time and energy we dedicate to work over the course of our existence, in many ways, our work becomes a life partner of sorts also - your other, other half. 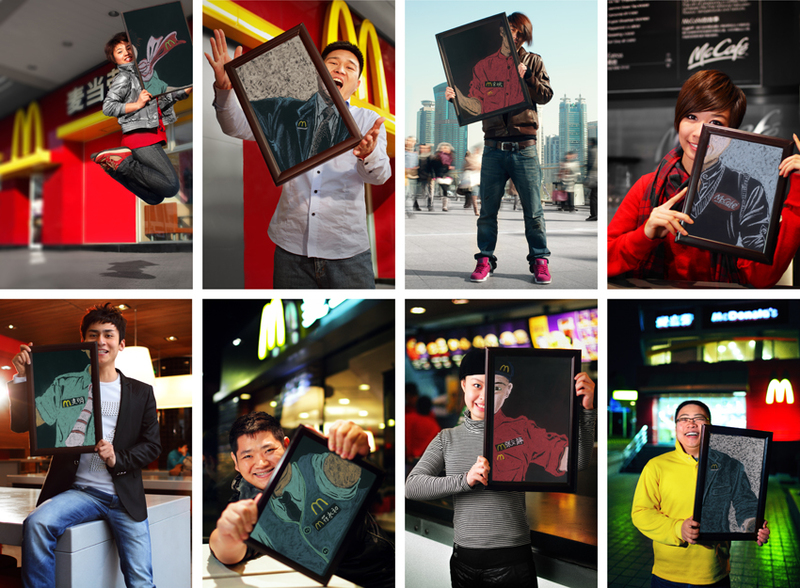 This eight-portrait campaign for McDonald's China went live summer 2011. It demonstrates how a work relationship with McDonald's has played a transformative role in the lives of eight of their employees from across the country. 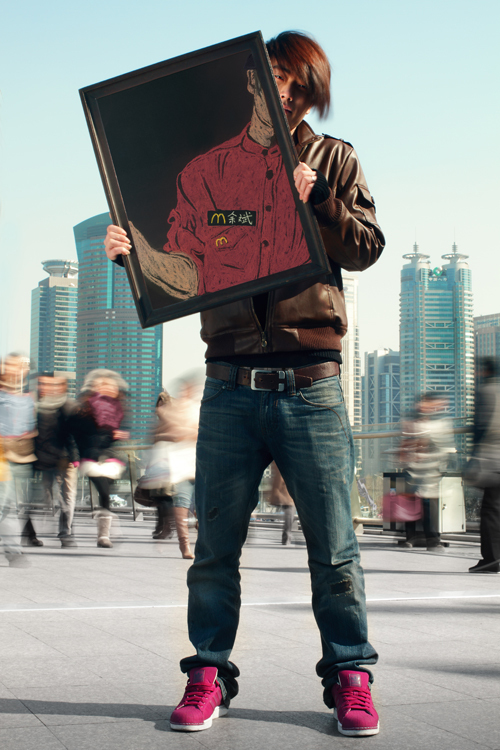 The employees were flown to Shanghai in February 2011 where I, along with creative director and illustrator Hwee Beng Poh worked to make images that conveyed the interplay between the employees' work and personal lives. Hwee Beng hired me for the job after seeing my photo project The People of Detroit on flickr.com [if you'd like read a detailed account of how this all happened and listen to me gush about being selected for this job the way a 16-year-old girl would gush about being asked to go to senior prom with the captain of the football team, click here]. In my personal project, I often make portraits of strangers who I encounter as-they-are; usually on the street. I then make impromptu decisions about what the subject happens to be wearing, their facial characteristics, the light and color palette available in the scene and I then try to synthesize these impromptu elements into an aesthetically pleasing final image. 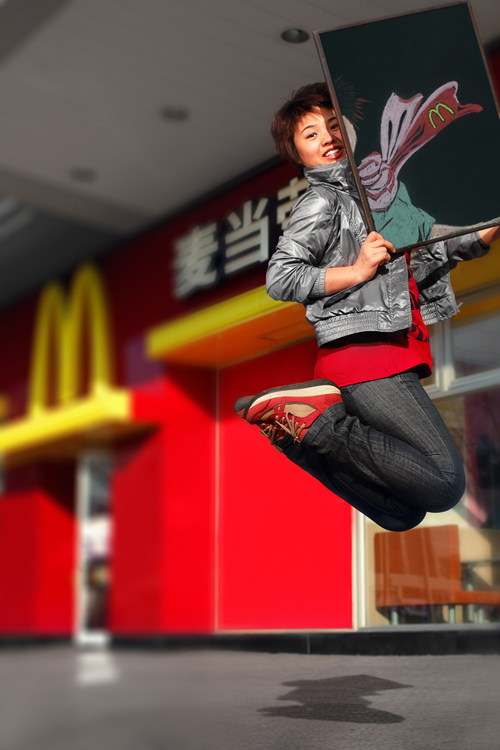 This style lent itself to the McDonald's campaign because in many ways I was asked to do the same thing in China. The purpose of the campaign was to show the employees as they are in their everyday life. That meant minimal wardrobe and styling; they more or less came as they were. Which was fine with me. In my opinion, people are at their best when they are being who they authentically are. My experience in China was nothing less than magical. Hwee Beng and her production crew are some of the most hospitable, kind, and humorous people I've ever met in my life. China is far and away the most unfamiliar place I've ever had the chance to experience but my hosts made me feel right at home. The subjects in the photographs were similarly amazing. They were genuinely excited to take advantage of the kind of emerging career opportunities in China that many people in America take for granted. I am honored to have recorded this very special time in their professional and personal lives. To view the individual portraits, the ad copy of each employee's story [translated from the original Mandarin campaign], and read a few of my personal notes, please see below the break. "I love to laugh. I love people. I love to fill my life to the brim. I am Liu Yan. 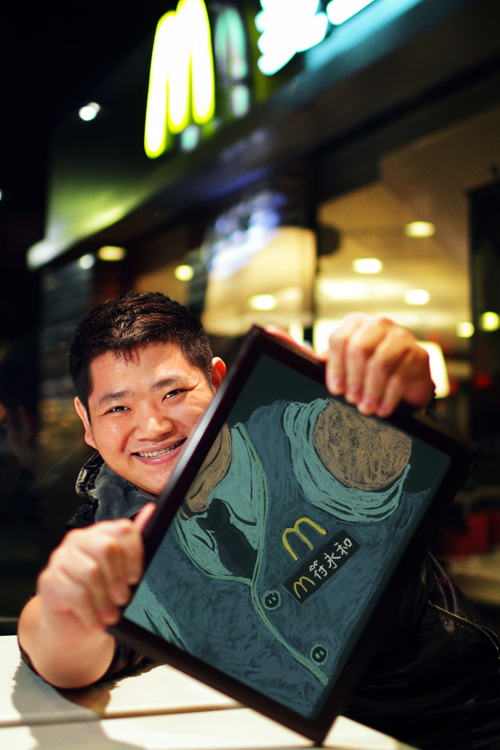 I am 25-years-old and I run McDonald's Shuangjing restaurant in Bejing. "I am not a genius. I just came to the right place." and the opportunities will come. It brings out the fight in me. I get so excited about the unknown challenges that await me. McDonald's - My the Other, Other Half. I'm Lovin' It." Lui Yan was the first person I shot for the campaign. This is one of the few shots were there was some styling involved. 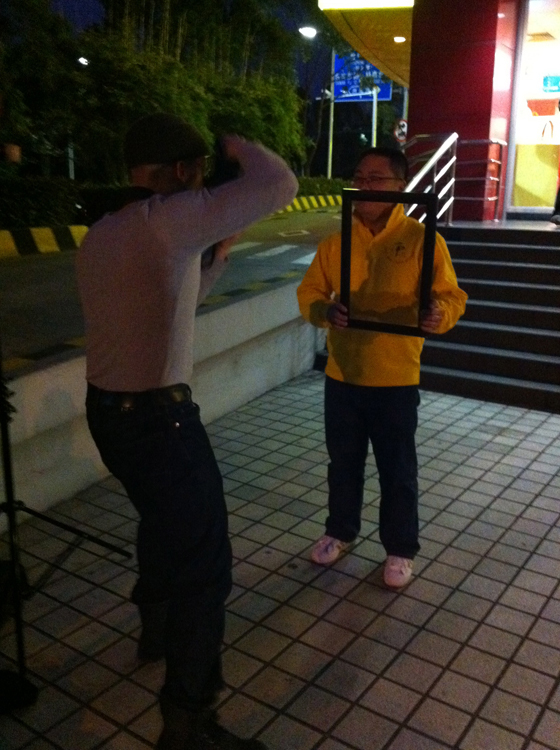 The night before, Lui Yan, one of the other female employees, a few members of Hwee Beng's crew and myself went to a clothing store and picked out the jacket and t-shirt Lui Yan is wearing in this shot. I figured the grey jacket and red shirt would fit the color palette of the store exterior. In addition to being far more responsible and accomplished than I ever was at age 25, as we shopped, Hwee Beng's staff told me that Lui Yan was also an accomplished athlete. You can see hints of her competitive nature in the ad copy. When we started shooting the next day, I wanted to make a portrait that represented her athleticism and competitive proclivities. I asked her to jump about 40 times in total with the image above being the favorite from the set. She never complained. She never stopped smiling. and I never thought that luck determines the success of restaurants. experience only reaffirms my beliefs. I am Sun Bing. I am 30. 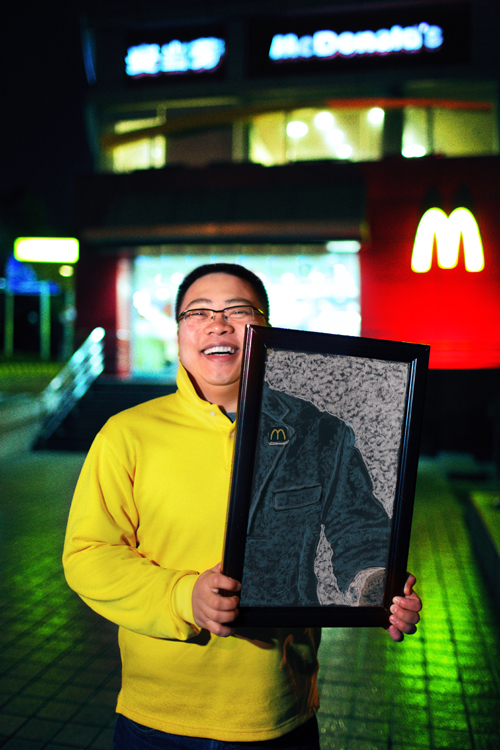 I am a Senior Real Estate Representative in McDonald's Bejing district. Every restaurant I've opened grosses more than ¥9 million [$1.3 million] a year. That's because McDonald's has the best knowledge base in the real estate business. That means I can always rely on the precision of the numbers that go into every decision. It's my further education in real estate too." 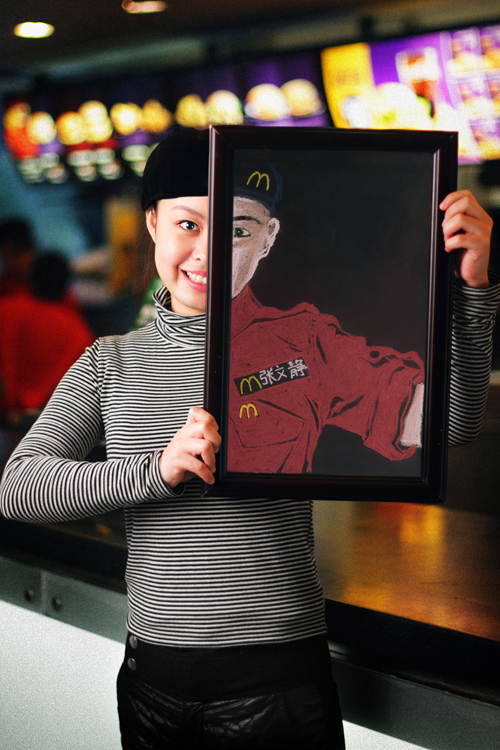 At McDonald's, as long as you continue to work and learn, you'll continue to succeed. "I used to hang out everywhere: internet cafes, playing pool... as long as I'm not alone. My parents had no faith left in me. And I didn't think much of myself either. Then I came to McDonald's. I worked, I played, I learned a lot. I won an Outstanding Employee award. I represented Shanghai in national competitions. I found out that I can actually do well, and now, I'm going to college. My next step? Restaurant Manager. "My parents think I've finally grown up." I am Yu Bin. I am 22. I am the Swing Manager at Xinzha Road Restaurant in Shanghai. I am loving who I am now. As you can tell from the ad copy, Yu Bin is a bit of a rebel spirit. I think that's reflected in the styling - which is his own. I loved the brown leather jacket from the jump. I was a little iffy on the fuchsia sneakers at first but, in the interest of letting the subjects' choice in clothing serve as a representation of their personality, I decided to go with them. Now I love the shoes. I think they really tell you something about Yu Bin's personality and they add a touch of color in an otherwise earthtone scene. I pre-visualized a photo where both Yu Bin and the modern buildings in the Pu Dong district of Shanghai were sharp while the people around him were blurred. Since it was a very bright day, this was accomplished by putting the camera on tripod, stopping down to f/22, using a 3-stop ND filter, and a 1 second exposure. Slightly out of the frame, an assistant held a reflector throwing some of the bright sun back onto the subject's face. In post production, I replaced some of the color in the moving mass of people behind Yu Bin with the color from his distinctive shoes. I felt this provided balance to the color palette and between background and the fuchsia-shoed badboy. "I draw. I dance. I try anything once. I am Chen Dongye. I am 22-years-old. I am a Sagittarius and always curious. four different roles in three and half years." and a Store Activities Representative. Haizhu Plaza Restaurant in Guangzhou. And my work is part of my life. and to see how I can do even better. Like most of the other portraits, the styling was the sitter's owns. I think she did a good job; Chen Dongye's personality was as vibrant as her red sweater and smile. "I used to hate school. I would forget everything I learned as soon as the exams ended. taught me things I could use at work. fall in love with learning." I've been to four training courses in my two years here. I've won the Golden Hat twice - that's the award for the best in class. at Wangfujing - Beijing's first McDonald's restaurant. I hope I leave every class a better person. I look forward to my next step up in my career ladder. Zhi Ming struck me as a happy, outgoing fellow. He was dressed in a sort of festive, party-goer manner. I tried to create a photo that suggested a party-environment even though this photo was taken inside of a McDonald's restaurant in Shanghai [which coincidentally, was as well appointed as some of the trendiest sushi bars I've been to in the States. Many of the McDonald's stores in China have significant attention paid to decor]. on a plane to Athens." "It was 2003. I was 19-years-old. 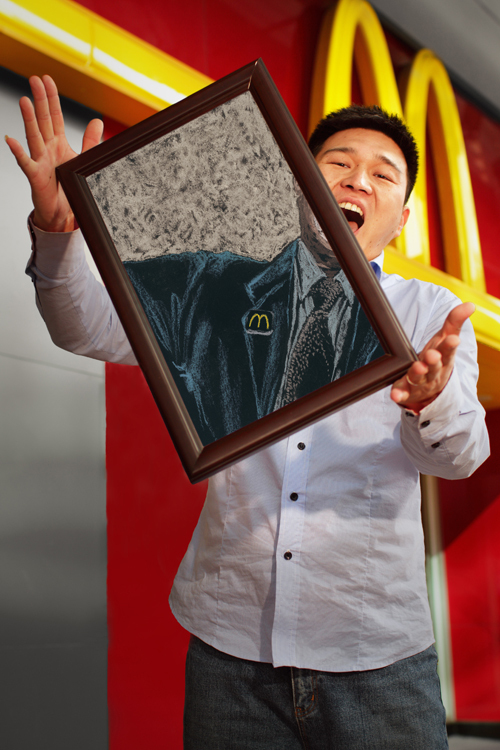 when I won the McDonald's All-Star Competition. I was on my way to Athens as soon as I got my graduation certificate. and met people from all over the world. It was more than eye-opening. I am Fu Yonghe. I am 26. 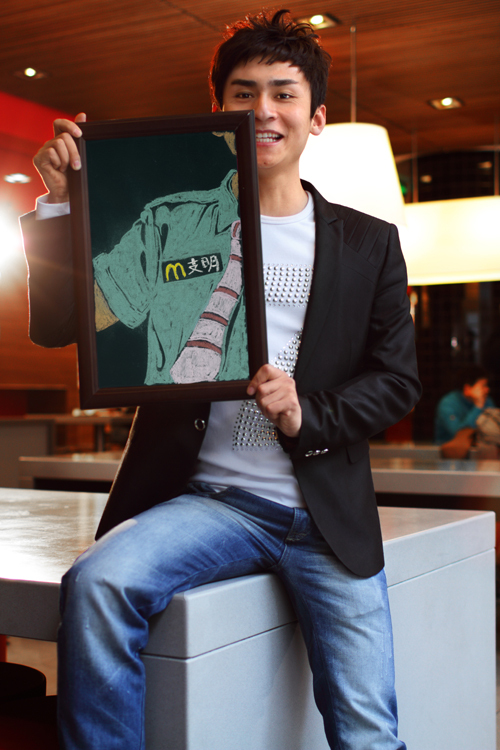 I am the Drive-Thru Restaurant Manager at Shengdajingdu, Haikou. my next goal is to become an Operations Consultant. That's exactly the path of a few of our global CEOs. Fu Yonghe was a lot of fun. Like everyone else, he was eager to be photographed and had a pleasant personality. He even accepted some good-natured ribbing from some of the other subjects. "I am an only child, just like most people in my generation. and my school friends all drifted away after we graduated. I am Zhang Wenjing. I am 20. I've been at McDonald's for two years. I am the Swing Manager at Minli Road Restaurant in Shanghai. I love working here because I'm not by myself anymore. "I love how it feels like one big family." My parents still think I am a child, but here at work I am the older sister. Some of my co-workers even chose to turn full-time because of me. Nothing feels better than working with your own family. Wow. Zhang Wenjing, like most of the people I photographed for this project, did not speak any English. As you may imagine, I did not speak any Mandarin. Because of that, all I really knew of her was that she was the youngest employee in the group. I never knew her backstory, until I sat down to transcribe it here. In all of my work life, I've always thought of jobs as little more than something you did because you needed a paycheck. I never thought of them as as something you did to fill a hole in your being. Zhang Wenjing's story is an emotive example of how overarching social and political policy affects the individual. Its also a sterling example of how work can assuage an aching need in one's personal life. I'm truly touched. "I am Xie Rusong. I am 32. I've been at McDonald's for seven years. I am in real estate development. To date, I've opened 97 restaurants together with my team. It's important to foresee the potential business opportunities in urban planning. I love the freedom McDonald's gives me. I started out as a freshman in real estate. 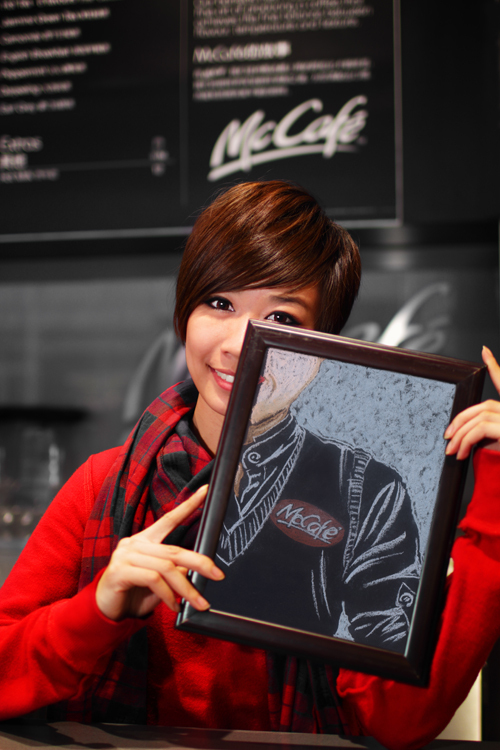 one-third of McDonald's new restaurants in China. you need to set your sights far. "Seeing one or two years ahead is fine, but can you see twenty years into the future?" So, this was the last shot of the campaign. The temperature hovered just above freezing, but since my friend Xie Rusong was such a big shot real estate guy, we had to take his photo outside, in front of one of the properties, away from the warm sanctuary of the restaurant interior. Even better, since the photo was going to be for a summer campaign, Xie Rusong had to be without his heavy winter coat. I wanted my subject to know I was as invested in this as he was. I took off my coat and did the shoot in my under shirt. I figured if I was going to ask him to freeze to death it was only fair if we all died together. To make things even better, it started to drizzle. As the tile in front of the store began to absorb the frigid tears of Satan, it began to issue forth reflections of emerald green glimmering light - as if to make aesthetic recompense for our existential discomfort. It was a concession worth taking. The shimmering green light on the wet tiles played perfectly with the yellow in Xie Rusong's shirt, the iconic McDonald's logo, and the intensely red light beneath it [provided via a portable flash with a red gel that I triggered remotely]. When all was done, I came away with a brightly colorful photo that I was pleased with. And, in total, I came away with an experience that I will never forget. These shots look Great!! - Good job! So many comments and questions! Hope I don't forget anything, as I will try to be brief. Um... for starters, I love how vivid the colors are. I dig the story about you finding out about the gig. Read it on Flickr. Missed it when you originally posted it. You're from Michigan, "just above freezing" weather shouldn't faze you anyway. Who did the animated part within the frames? I dig Yu Bin's shoes. I wouldn't rock 'em, but I dig them in the photo. Additionally, can you explain to me about the 3-stop ND filter? It's purpose, etc. I have a strong idea, but I'm not positive. I'm assuming that it was so bright outside that the filter was used to achieve the 1 second exposure - basically taking your f/22 and making what would be the equivalent of a 3-stop smaller aperture. Overall, I love the campaign. They chose the right man. I love the concepts, and particularly the thought and effort you put into making sure all the colors worked together and were aesthetically pleasing. I really like the vibrance in the pictures, they feel so spontaneous innocent. My absolute favourite is bad boy Yu Bin. The color contrast between his leather jacket and the blue fading background is just so pleasing to the eye and transmits this asian feeling. But the uniqueness of the picture is the movement of the people and his hair, that makes it very special! Who knew "The People of Detroit" would lead to something like this?